We are the leading Martial Arts Equipment supplier in the World with branch offices in the USA, Japan, Chile, Ecuador, Mexico, Germany, Hungary, Portugal and China. We supply Top Quality Martial Arts equipment to all levels: from beginners to high ranking masters. Many of our staff are highly skilled Martial Arts instructors, who has participated in various International tournaments, placing at high rankings in the world. If you have any questions, please feel free to contact us, and I am sure we will be able to help you. 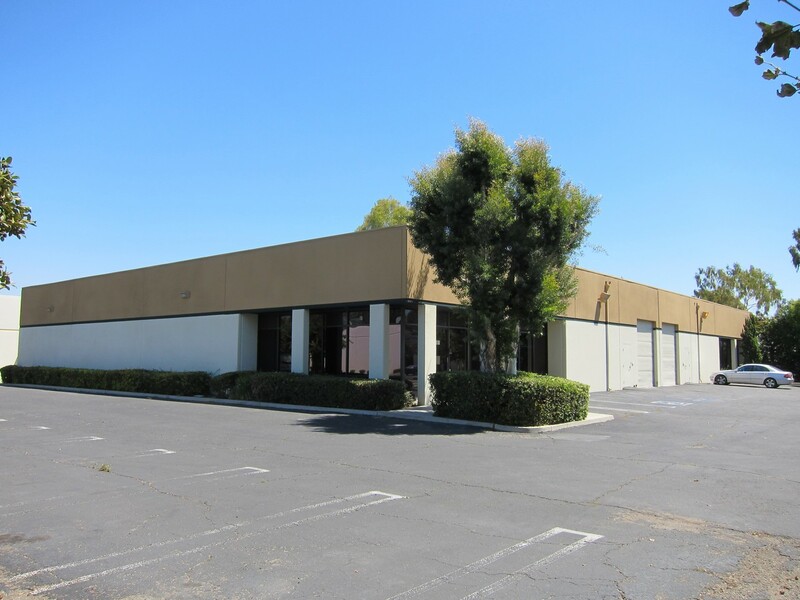 E-BOGU.COM, Inc. headquarters is conveniently located at the heart of Orange County, next to the freeways 405, 5 and 55, and minutes from the Orange County Airport. E-BOGU.COM, Inc. has offices worldwide (USA, Japan, Mexico, Chile, Ecuador, Argentina, Colombia, Portugal, Hungary, Finland, UK and Germany). For Worldwide E-BOGU.COM, Inc. locations, please click here. World Athlete Support (CEO Toshihito Kokubun Karate 4th Dan) and e-bogu.com Inc. join forces to support the World Martial Arts community. Kokubun sensei spent 4 days at e-bogu.com Inc. discussing with Taro Ariga (e-bogu.com Inc. CEO) on the future of Martial Arts in the world, as well as the development of a strong partnership between the two organizations. e-bogu.com Inc. was the official sponsor for the 19th European Kendo Championships, which was held in the beautiful city if Budapest, Hungary. 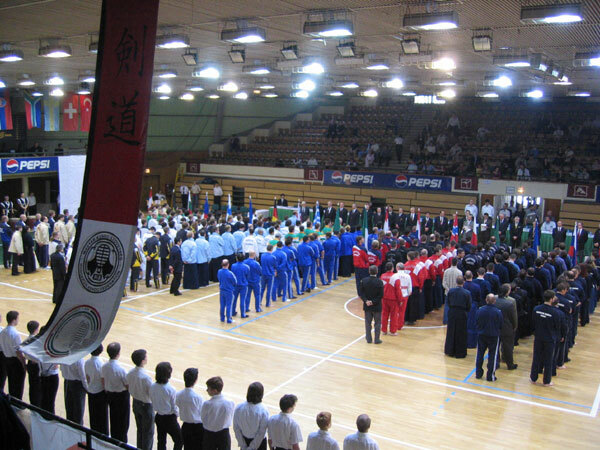 The Championship was held over 3 days (April 23 - 25, 2004), with 28 participating countries, and over 3000 spectators. 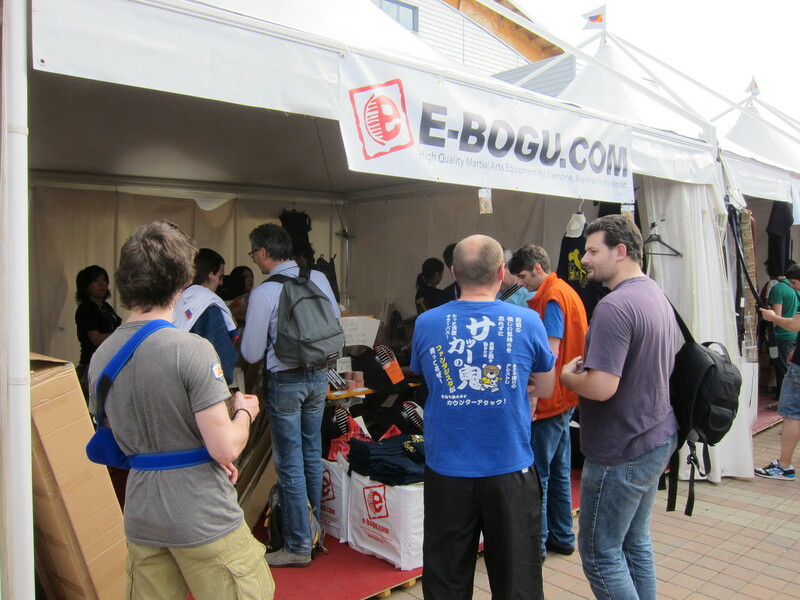 e-bogu.com sent 4 staff to sponsor the Championships, by having a booth, which more than 2000 people visited our booth. To see the tournament results, click here. Musashi Miyamoto was definitely the most famous Samurai of all times. This drama presented by NHK is a year long TV series about his like. e-bogu.com Inc. presented a year long TV commercial advertisement campain during this TV series. To see a clip of our commercial, click here(1MB). 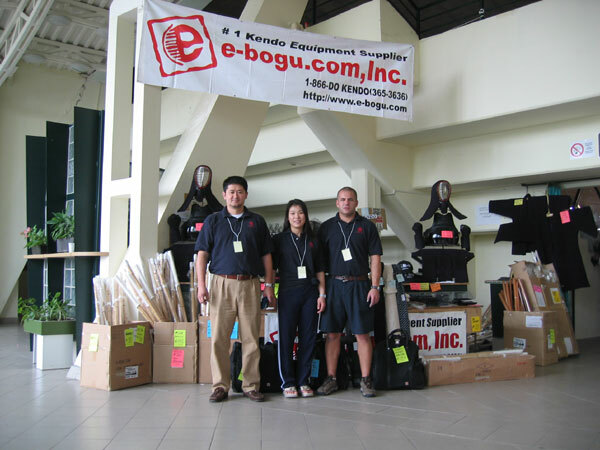 e-bogu.com was the proud sponsor of The 13th World Kendo Championships 2006 Taiwan. We did not only participate as a sponsor, but many of our staff worldwide, achieved great results in the tournament. e-bogu.com Inc. was also the official sponsor of the Canadian National Kendo Team at the 13th World Kendo Championships in Taipei, Taiwan (Dec 8 - 10, 2006). Canada team placed 3rd in the women's division, and the Men's advanced to the quarter finals. D. Taguchi and S. Kamata awarded the Fighting Spirit Award. e-bogu.com, Inc. was a proud sponsor at the 11WKC in Santa Clara. 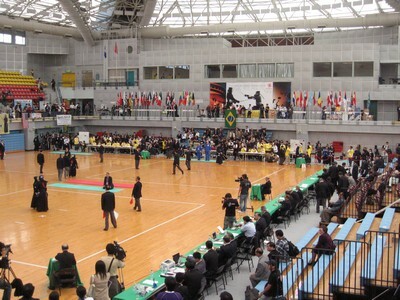 We supplied the tournament with high quality equipment, shinai, and souvenirs. Over 2,000 kendokas visited our booth during the three day event. Once again, we would like to thank everyone who visited us. 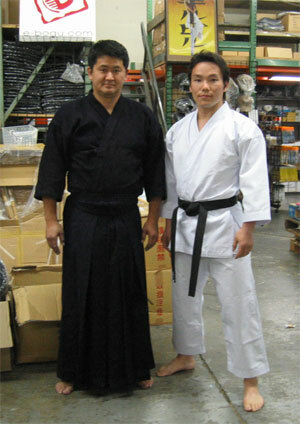 We promise to continue providing the kendo world with high quality/low cost kendo equipment. 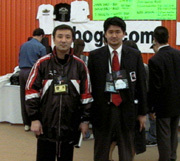 M. Miyazaki (All Japan 6 times champion, World Champion) and Taro Ariga (e-bogu.com CEO - member of team Canada for 11WKC) in front of the e-bogu.com booth at the 11WKC. Taro Ariga participated as the Taisho of the Canadian Team placing 3rd in the team matches. In the past Ariga has competed against Miyazaki in the 7WKC in the semi-finals. Taro Ariga, CEO e-bogu.com Inc. I am in love with this beautiful art: Kendo. I am most certain of that. I started Kendo in Brazil in 1975, and since then I have visited many different Dojos all over the world. I was very fortunate to have been taught by many different Senseis, who were all great instructors. They taught me not only Kendo techniques, but also the fundamentals of human character. So here I find myself now, thanks to all the Senseis, who made me work hard all these years. After living in Brazil for twelve years, I moved to Canada. There, I eventually became a member of the Canadian National Team for the World Kendo Championships - for five consecutive tournaments. In 1992, I moved to Japan to join IBM Japan, to pursue my career in the IT (Information Technology) field. There, with the help of many, founded the IBM Kendo Club. During my 6 years of living in Japan, I had the opportunity to really enjoy Kendo, and learn the Art in depth by visiting different Dojos and meeting new Kenshis everyday. By living in various countries, I realized how difficult it is to obtain good quality Kendo equipment outside of Japan. That is when the idea of integrating my IT expertise and my love for the traditional Japanese art came to my mind. 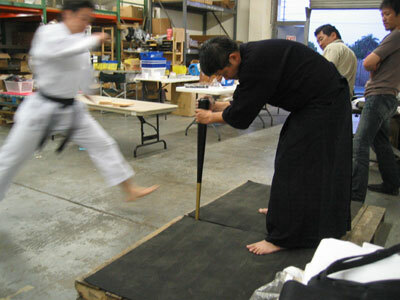 This was the start of e-bogu.com Inc. Our headquarters is located in Los Angeles, California, providing high quality Kendo equipment to Kenshis all over the world everyday. e-bogu.com's four partners and all the staff are active Kenshis. We know what good Kendo equipment is, because we use them during practice everyday. Just to give you an example, we select our Shinai collection based on our favorite Shinais. They are very popular among high-ranking Senseis. "High quality Martial Arts equipment for everyone, anywhere in the world" will always be our motto. I really enjoy doing what I am doing, as I am communicating directly to our clients, discussing Kendo and there is always something new to learn everyday. I hope you enjoy shopping at our site, and if you have any questions, please feel free to contact me directly. 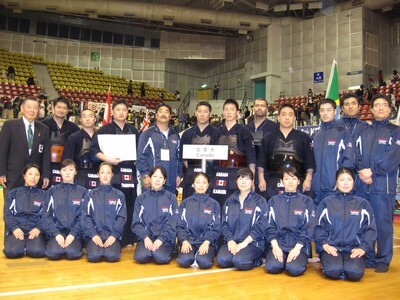 Taro currently holds 7th Dan Kendo Kyoshi and is actively involved in International Kendo. Started Kendo at the age of 8 in Brazil, continued practicing in Canada, Japan and the USA. Graduated from University of Waterloo, Ontario, Canada, founded the University of Waterloo Kendo Club in 1985.